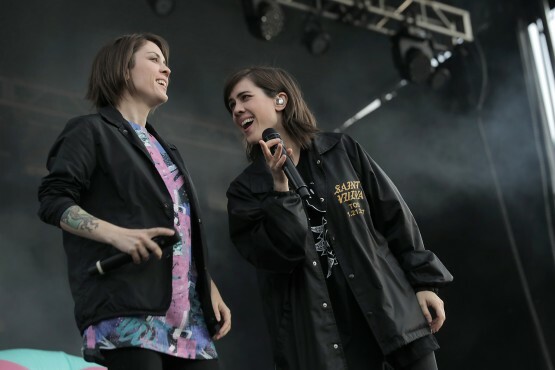 The atmosphere in downtown Victoria was electric on June 30 as Tegan and Sara took to the stage for Victoria’s Spirit of 150 celebration. Thousands of people, clad in festive red and white attire and munching on food from the trucks that lined both sides of Belleville Street, covered the lawn of the B.C. Legislature for the show. Opening up for the Calgary-born duo were three west coast bands — Rococode, Carmanah, and Delhi 2 Dublin — who showcased the diversity of Canadian music talent. Delhi 2 Dublin, the final band before the headliners, had the crowd on their feet and dancing by the end of their first song, perfectly gearing spectators up for Tegan and Sara Quin — the sisters behind the eponymous Canadian indie band. Flanked by massive inflatable “T & S” characters on stage, Tegan and Sara kicked things off with a fan favourite “Back in Your Head” from their 2007 album The Con. Next came “How Come You Don’t Want Me,” “Drove Me Wild,” and “Goodbye, Goodbye,” three tracks from their breakout 2013 album Heartthrob. With eight studio albums worth of songs to choose from, the set list was a medley of old favourites and new tracks from their latest album Love You To Death, released in June of last year. With an indie and synth-pop foundation, the twins’ songs are layered with emotion and adorned with catchy hooks that stay in your head for weeks. The middle of their set was punctuated by some older material, like “Alligator” and “Northshore.” Then, returning to The Con, the duo played my two favourite songs, “Nineteen” and “Call it Off.” Throughout the set, the twins’ intuitive vocal partnership made switching between songs and singing roles seamless. While Tegan and Sara have performed in many countries, it is clear that Canada holds a special place in their hearts. “This one goes out to my sweetheart Canada,” Tegan said before performing their hit single “Boyfriend,” sending the crowd into waves of cheering and applause. Victoria was the fourth place the Quin sisters ever performed, following Calgary, Edmonton, and (“strangely enough,” said Sara) Nanaimo. “Victoria has a special place in my heart,” shared Sara, informing the crowd that the twins have family here and often came to the island during their childhood summers. Tegan and Sara, who both identify as lesbian and are well-known advocates for LGBTQ rights, also gave a shoutout to Victoria’s LGBTQ community, saying “things do get better,” and dedicating their song “Hang On to the Night” to that community. As the show drew to a close, the duo thanked the crowd and all their fans, old and new, for all of their support over the last 20 years of their music career — whether through attending one of their concerts, purchasing an album, or just singing along to their songs on the radio. Their final song, the hit single “Closer”, finished off the evening perfectly. “I won’t treat you like you’re typical,” the Quin sisters sang, celebrating a country in Canada that is far from typical.